When The Meg was announced back in January of 2017, nobody really knew what to think about it. However, as the months went by, a clearer picture of what the movie is going to be started to take shape. We've since learned that Jason Statham is calling the movie a cross between Jurassic Park and Jaws, which sounds pretty intriguing, but also adds quite a bit of extra pressure on the project as well, since he name dropped two of the biggest movies in Hollywood history. We've seen a picture of The Meg in murky water, and now we're getting a look at the crew in this brand-new image. 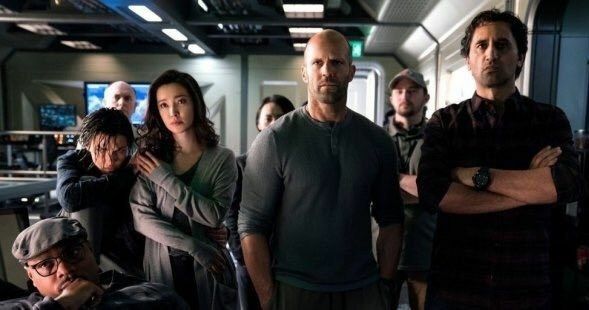 The new picture from The Meg has Jason Statham front and center, surrounded by the crew and things don't look like they're going very well. The crew includes Page Kennedy (DJ), Li Bingbing (Suyin), Ruby Rose (Jaxx Herd), and Cliff Curtis (James). Rainn Wilson also stars in the movie, but he is not shown in the new picture. The movie is based off Steve Alten's 1997 book entitled Meg and the picture is taken from the inside of the doomed ship at the bottom of the Mariana Trench. The Meg has been in development since the book came out over 20 years ago. There have been many false starts, but it wasn't until 2007 that the project really looked like it was going to happen. New Line had the rights and at one point in time, Guillermo del Toro's name was attached to the project before the studio scrapped the plans all together. The Meg was brought up again in 2011 and then it was announced in 2015 that Eli Roth would be helming the project, only to leave less than a year later due to creative differences. John Turteltaub was later revealed to be the director with Jason Statham signing on soon after. The Meg was originally slated to come out in March of 2018, but it was later pushed back to August of 2018, which was probably done to tie into the Discovery Channel's Shark Week. This movie seems tailor-made for fans of Shark Week and one can practically see the TV spots for it at every commercial break. The Meg is gigantic prehistoric shark that didn't go extinct and it's down at the bottom of the Mariana Trench, teasing a doomed deep-sea submersible, which Jason Statham's character, Jonas Taylor, will have to go save. We're still waiting for the teaser trailer for The Meg, but one can imagine that it will be coming within the next few months, especially since it was supposed have been released in March. It's hard to believe that the movie has been teased since 1997, but we're finally going to get to set our eyes on what the Chinese call "Jurassic Shark" near the end of the year. You can check out the newest image from The Meg below, courtesy of Jurrasic Shark's Twitter account.